Believe it or not, after recording this preview episode, community guest CountingConflict messaged me to apologize for his drunken ramblings. As if this was a bad thing. Let it be known that Failcast promotes all manner of drinking and encourages listener participation if you have the means. It just makes our words that much sweeter. In addition to our guest, Yashoki and Necros are on the show, as well as Riser Glen, who was totally here the whole time. 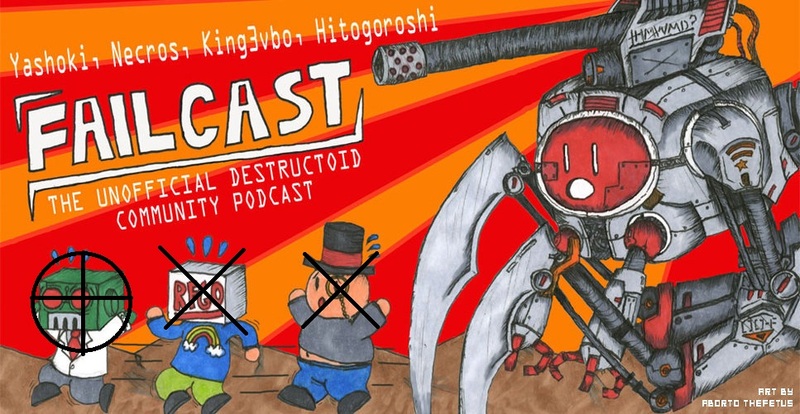 Listen as we weigh in on Dtoid's humongous flash game contest, talk about Dead Space a bit too much, and toss out random lovehate to some very special community members. Oh baby, don't be like that. We only hit you 'cause we love you. Get to downloading, this preview episode is longer than most.